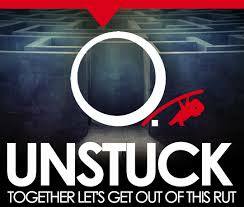 This past weekend I had the opportunity to attend an amazing event called "Unstuck" hosted by my church H.O.P.E. 's House. I shared in my post here yesterday that I had an awesome encounter with a sister after the conference but I wanted to share a few nuggets that I got from each of the 4 sessions that I went to. Hope you enjoy! Our lead Pastor and founder of the Unstuck conference, Andrea Humphrey, kicked things off with a lighthearted song that would become the anthem of the day at least for me. She had us all stand up and sing along to Natasha Bedingfield's song, "Unwritten". I personally love this song and was excited that she chose it. However this time I actually listened to the lyrics and a few things resonated with me. One I now understood that my story is my own, that this life is my own and that no one else could live it for me. No one else can speak the words I have been given or write them for that matter. It's my responsibility. Secondly, my favorite line of that song is when she sings, "Feel the rain on your skin, No one else can feel it for you." That's so true. I have to feel and know for myself the pain and joy of each experience. This is my life. I can't pawn off my hard work, preparation or achievements to anyone. I must own them and live them. Lastly I heard possibility in this song. There's so much that is unwritten. There's so much more coming. There's so much that I haven't seen or heard nor have others. This was such a great declaration to begin the conference. Pastor Dre as we call we affectionately call her, went on to share how she came up with the idea for the conference and the key things she wanted us to take away. One of those things is how preparation is essential to our success. She even rewarded those who prepared with gift cards. She gave one sister a gift card for bringing her resume to the Career Strategy session. She gave some to those who traveled the furthest and those who paid for people to attend. Her point was made even clearer with her actions. If you are prepared when an opportunity arises then you will be successful. Next I attended a session on financial strategy conducted by Ese Akpovi, PMP, CPA. I know her and she's so thorough and legit. I was excited for this session since my hubby and I are on our Journey to become Debt Free by May 2018 and I want to absorb as much information about managing my finances properly. One of the things Ese shared was that sometimes we STUCK when money takes on the form a person rather than it's original purpose as a tool. This concept was mind blowing for me. I never realized that I could be treating money like a person. If it's a tool then it's something that you can utilize to help you manage your life but if it's a person then it's used to gain acceptance, fill gaps in the past, console or provide therapy or change people. She also talked about the importance of managing your money so that you can become a master over it. However if you can manage your money then how you master it and if you don't measure you money you can't manage nor can your grow it. She did provide some great solutions and helped us understand the purpose of money as well as dispel some common myths about the rich like they drive expensive cars. It was a very sobering presentation that was founded on facts and principles. Stacy Andrews a celebrity make up artist with over 18 years experience led the next session I attended. Her take on Image was refreshing and before sharing glam tips she made sure to stress the importance of loving yourself and thanking your body for all that it does for you each day. It may sound a bit silly but it made sense to me. When was the last time I said thank you for my blinking eyes. I really can't remember ever saying thank you to God or being grateful in general for all the many functions of my body and appreciating who I am and how I am made. This is an area where we get STUCK surrounding our image and s Stacy also shared the top 20 things every woman should have in her wardrobe regardless of age, race, size and preferred style of clothing. She walked us through a full make up tutorial live on one of the lucky attendees during the session. She also showed us some simple ways to achieve highlighting and contouring without looking like we were headed to battle with our war paint. She even dispelled some popular myths floating around YouTube. My favorite part of the session were the tips on hair care and skin care. She knocked it out of the park and made things so simple. Lastly was the session I attended for married women only on relationships. This was a much needed tune-up for me. I love my hubby and I love our marriage but regardless of how great it is there are areas that could use some improvement but more importantly there are areas in my life that need improvement and this session really brought it to light. Nina Stewart who co-leads the marriage ministry at our church with her husband spent a nice chunk of the session going over the differences between husbands and wives and our needs. Now most of this stuff I remember somewhat from our marriage preparation classes but some I forgot. However in some instances since I've been married for a little bit I have more experience so some things speak to me in new ways. My main takeaway was that as a wife I really have some much influence in my husband's life because of my position. And I could use that influence for good or evil the choice is up to me. I could use that influence to encourage and speak life or to destroy his ego and tear him down. My goal is to uplift him and encourage him and do my best to meet his needs as much as humanly possible. I want our marriage to go the distance but there is work to be done and it doesn't start with him it starts with me. Overall the conference was a successful so many women were encouraged and touched by the sessions. I spoke to several people that were really blessed by what took place. I know my life was made better by attending and I look forward to the next one. Leave me a comment below and as always thanks for reading. Stay Tuned for details for Unstuck 2016. You don't want to miss it!